It is a compelling paradox, when effectively exploited, that while photographs can seem to capture reality, they do not. In a series of landscape photographs taken between 2004 and 2006, artist Clifford Ross created what might be the largest, highest resolution images ever made. 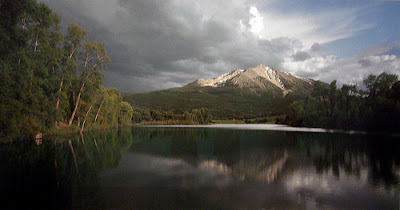 In an interview, while Ross acknowledges that "photography has always been a lie to some extent," nonetheless he states his goals for the work as including "creating a 'you are there' experience for the viewer," to "capture as much reality as possible in one exposure," and to "give the viewer more power, because the viewers have the choice to look wherever they want, just as they would if they were in front of the scene." I find these images compelling, not because I think they have achieved the goals of the artist, but because I think that they haven't and can't. Standing in front of Mountain IV, I raise my head to take in the full expanse of sky and my eyes are met by a frame bordering the edge of a picture. Evidently, I am not "there." To speak of capturing experience with a photograph is not only to ignore that experience is more than just visual but also to deny that experience is located squarely, inalterably in time. Ross has tried to create an experience for the viewer in front of a representation, one that would reproduce his own experience at a place. This idea, although commonly espoused by viewers and practitioners alike, to me is rather odd. Following it through, would the ultimate representation of a place be an exact, physical recreation of that place? How close to real can you get before you decide to just get in your car and see it yourself? There is an incredible and captivating amount of detail in these images. What intrigues me is the fact that in spite of this, maybe even because of this, they are utterly, impressively unlike reality. 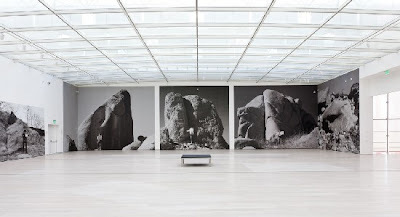 Michael Heizer's exhibition "Actual Size" consists of a dozen or so very large, very grainy photographs of boulders. In many of these photographs a single person stands at the base of a boulder holding a sign that quantifies the boulder's size- height and width measurements in feet, or, estimates of mass in tons. What is implied is that the boulders in the photographs are equivalent in size to the boulders themselves. I do not know whether or not it was with a sense of irony that Heizer titled this work, but it is the irony and humor that I appreciate most. Opposite to what the title suggests, it is precisely the distance between the thing itself and its representation that gives this work its power. For how exactly are these prints the "actual size" of these boulders? Let's back up. All representations are a distortion of space and this begins with what we see with our eyes. So compelling is our sense of sight as a reproduction of space that we forget to recognize it as such; we imagine that what we see is what is; it is rather that what we see is an interpretation of what is around us- an interpretation defined and determined by usefulness. Photographs are two-dimensional representations modeled on human vision. A two-dimensional print makes space intelligible but cannot, by definition, accurately represent the actual size of a three-dimensional object. At the site of these boulders the objects themselves can be walked around and vantage point is not constant. In a print, vantage point is fixed, and depth can only be implied. We feel it vividly and yet, it does not exist. If, in a print, the height of an object from point A to point B is represented accurately, then the width of that object from point C to point D, unless the object is completely flat, cannot be accurate. For all of the above reasons I might suggest, playfully, the alternative titles: "Seemingly Actual Apparent Size from a Single Vantage Point," or, "Approximate Actual Size with the Exception of Depth and Mass and Disregarding Lens Distortion." Much of the above critique is centered around the kind of language that is frequently employed to talk about photographs. But it goes deeper than that. Commonly used language such as "capturing reality" or even "take a picture"- as if a picture is an object or a commodity even before it becomes a print, an object capable of containing a moment- such language reveals a set of views about what photography is and does that is flawed. It is obvious that prints are not "real," however, it is significant that we talk about them as though they are. The phenomenon I am describing goes to the heart of what makes many of the most interesting images powerful as images. In the case of Heizer's photographs, we delight in being told that they are the "actual size" of the boulders they represent, and submit to this fiction to the point where we almost feel the presence of massive objects, despite the fact that we are looking at images on the surface of paper just millimeters thick. We allow ourselves to be fooled, wittingly or not, and we enjoy it. Mountain IV, by Clifford Ross, is part of the exhibition "In Focus: Picturing Landscape" on view at The Getty though October 7. Michael Heizer's Actual Size can be seen at the Los Angeles County Museum of Art though September 9.